Where can I get a minimally invasive hip replacement by an orthopedic surgeon in Boynton Beach and Boca Raton? Minimally invasive hip replacements have several advantages over their predecessor the ‘open’ hip replacement. But why exactly is a minimally invasive hip replacement better than a traditional ‘open’ hip replacement? 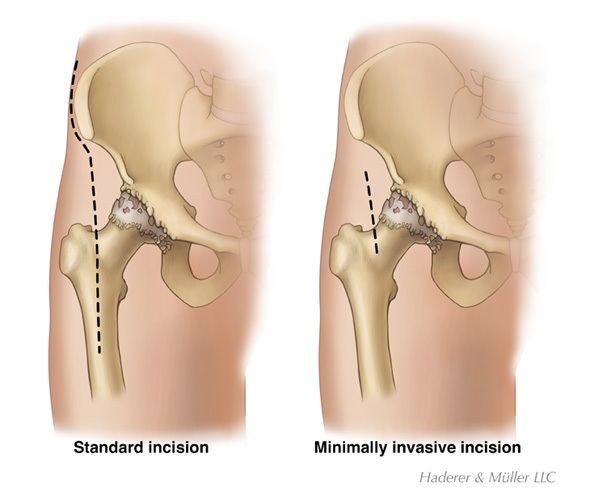 Minimally invasive hip replacement requires less cutting of the tissue surrounding the hip. This small incision means that there is less blood loss, a smaller scar, and a quicker recovery time, hence the description ‘less-invasive’. It can either be performed with one incision (single-incision surgery) or two (two-incision surgery). Two-incision surgery leaves two smaller scars, as opposed to a slightly larger scar with one-incision surgery. Minimally invasive hip replacements usually result in a shorter post-surgical hospital (or surgery center) stay, plus a quicker return to maximum medical improvement. Which orthopaedic surgeons in Boynton Beach and Boca Raton perform minimally invasive hip replacements? Read more about Orthopaedic Surgery Associate’s orthopedic surgeons in Palm Beach County.